Tagline: One very very lonely calorie. Global citizenship is not a novel concept. Every time there is a war, we hear a call for unity. Musicians come together to make tribute songs and donate the proceeds to charity. We are the world, indeed. Today I received an e-mail about a design competition. Adbusters is asking designers to create a world flag, free of words. The imagery should portray unity. I can’t help but be skeptical about the design of a global flag that unites global citizens. I want to believe. Last year we worked on a “Brand America” project, where the goal was to improve the image of the U.S. globally. My good friend Joe Quattrone and his team were selected to present their vision in front of an audience at Ad Week in New York. The event was sponsored by Businesses for Diplomatic Action, BDA, a non-profit organization concerned with the disconnect between policy and action. Keith Reinhard President, Business for Diplomatic Action Chairman Emeritus, DDB Worldwide, is committed to the reversing the rise of anti-Americanism that has come out of the shadows in recent years. He’s not alone. Strengthening America’s perception across the globe through action is worth billions to corporations. That’s not neccessarily the best reason to unite, but the call to action is serious. There is a movement towards global citizenship slowly building. People across continents are focusing on global issues. Everyone knows that talking isn’t going to solve anything. Which is why more and more people are taking action. Businesses are taking action too. If you have time between now and December 1st, 2008, give the flag design a shot. It’s not about everyone coming together, it’s about you doing your part. It's over. We began our journey in August of 2006 and last week it ended suddenly. No more presentations, competitions or peer reviews. At least in the collegiate sense. Now it's time to apply our lessons in agency and corporate settings. To me, the VCU Brandcenter experience is worth it. I now have a masters degree and I am part of the future of the industry. It wasn't always easy and frankly, I didn't think I'd make it after the first semester. I had to do more outside of school in order to become a better student. In addition to the required course work, I read dozens of advertising/branding (audio) books, wrote nearly 400 blog posts and stayed focused on the big picture. I made some new friends and expanded my professional network. I also seized the opportunity to differentiate myself using digital technology. So, if you're thinking of attending VCU Brandcenter in any track, remember that everyone has sixty weeks to earn their degree. What you do in addition to school can have a major impact on your progress. The same concept holds true in the workplace. Man, It has been a busy semester. A busy two years at that. When I first signed up for VCU Adcenter I had no idea what I was in for. I knew I was going to learn a lot about advertising and branding, but I had no idea how much things were really changing here at the school. Adcenter is now VCU Brandcenter and the school has earned some new credentials. 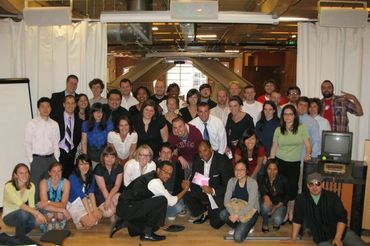 We are now one of the top Design schools in the world and most recently the top digital school for marketing by Adage. It's been a great experience and I don't regret any of it. I apologize to any readers who may feel abandoned by my lack of writing on this blog. I have been writing at Beneath the Brand and at Beyond Madison Avenue a little more these days. In addition to grad school work and writing my thesis. But I feel like I owe aspiring ad people some content. I originally set out to document my experience at VCU Adcenter, now Brandcenter and you deserve nothing less.I will be posting a lot more in my final three weeks of school to cap off the experience. I will be pulling some posts from other blogs that I write, but I'll keep the Brandcenter commentary going until the end. The ad industry is preparing for the big shows. The ANDY Awards, ADDY, Clios, One Show, Cannes and the Art Directors Club begin their calls for entry between September and April. These awards shows celebrate the best of the best. Judging is done by expert panels of industry folks. Each one of these shows also features a student competition, where students from all the ad schools (and brand schools) submit work. VCU Brandcenter and Miami Ad School both have solid reputations at these shows. Some of the student winners will go on to be creative directors. This ad is an example of some great student work. Jason Rosenberg is the Art Director and Tim Gordon is the Copywriter. The work took many hours to produce because it was made using hundreds of still images. Working with no budget and limitless creativity Rosenberg and Gordon created something special. This ad for JBL Creature Speakers is off to compete at the The ANDY Awards. I’m predicting that they will come home with an ANDY. Change is here. That's what is says at adcenter.vcu.edu/change, the location of 10 viral videos leading to a final video titled "Erasing." The lines between creative/business, content/communication and interactive/experiential were said to be blurring lately. Blurring is an understatement. The folks at the top have begun to change their view of agencies in general. Advertising is a part of branding. The lines are being erased as this video suggests. VCU Brandcenter launched their new site today. The site was designed by R/GA. It features a new triangle logo and more flash functionality. I haven't made it through the entire thing yet. There's a lot to take in. In a few short hours we will have our first classes in the new building. Change is definitely here. It's actually been here for a while. We are just being more vocal about it these days.